I love South Australian food produce and fruit, especially the freshness you can always expect from your first bite. Well, it is not always the case. One of my very good friend asked me this question once – You don’t expect a pineapple from SA. You know they are produced in tropical weathers. Surely, I don’t. About a month ago, I visited Brisbane twice – one for business reasons, one for holiday with Tina. What I found there was that their pineapple tasted much better than ones that I would be able to find in Adelaide. To be honest, I never thought about this before. How much difference would it be between a northern NSW pineapple and a QLD one? Believe me, they are different. After arriving back in Adelaide, the delicious flavours of QLD pineapple always got me to think that I would buy some from the internet. With this in mind, then when 10 QLD pineapples arrived in front of my door, you would know how excited I was. The pineapples I got were from Pinata Farms which is one of the leading fruit companies in Australia. 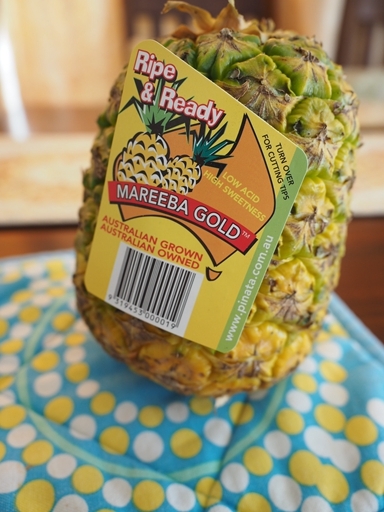 The variety of the pineapples was Mareeba Gold, which is the first pineapple of its kind in Australia. Mareeba Gold pineapples started to be trailed in the 90’s and grows mainly in Northern Queensland, which is most famous for its tropical weather and indeed the best taste fruit flavours. The weather in the region is almost perfect for the pineapples to grow. 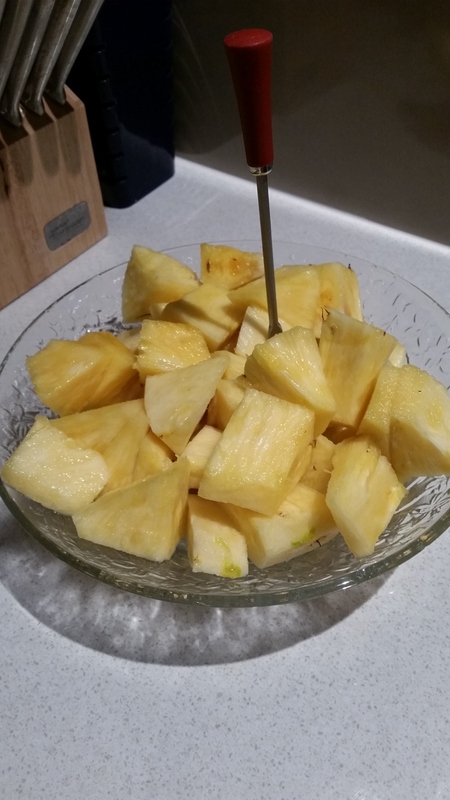 The pineapples were easy to cut and have soft fleshes comparing to other commercially available ones. Most importantly, these fruits tasted brilliantly. There is very very minimal amount of acidity and sourness, to a level which it can literally be ignored. The fleshes were super sweet with ripe and fresh fruit flavours. These two aspects were consistent with both green and golden pineapples. These pineapples are such jewels in Australia and I strongly suggest you to try them out. 1. Juice the whole pineapple and boil the juice in a sauce pan to make it a bit concentrated. 2. Soak the salmon wings in the concentrated juice overnight. 3. Using the ingredients in the batter to make a batter. 4. 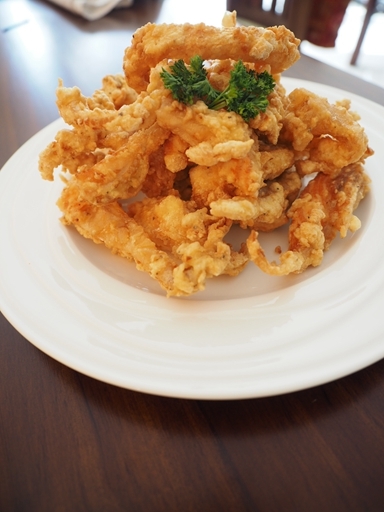 Heat oil in a deep fryer and dip the salmon wings in the batter. 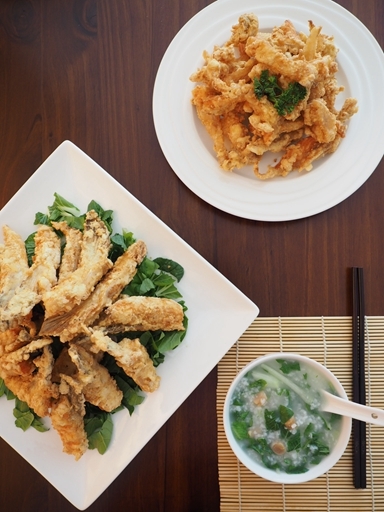 Try to avoid having too much on the fish. 5. 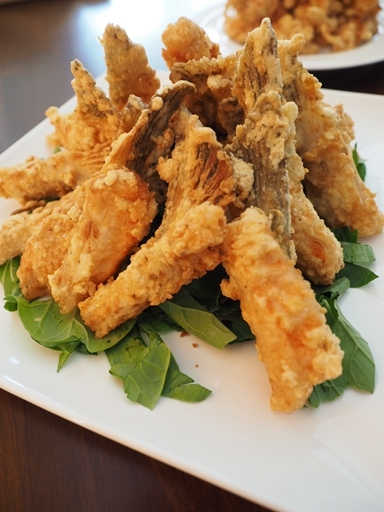 Deep fry the wings until they are golden brown and serve with salads. Want to enjoy the pineapples or want to cook up a storm with the pineapples? Pinata Farms is giving one lucky home cook the chance to WIN a fresh Mareeba Gold pineapple prize pack, delivered, valued at a total of $500. To enter, simply post an image of your original Mareeba Gold pineapple recipe or serving suggestion to Pinata Farms’ Facebook page from 9am, March 16. Get creative and give your recipe name an enticing name! Written recipes are not required. Competition ends at 5pm, March 31. The entry Pinata Farms likes most will WIN. Entry is open to Australian residents only. Terms and conditions apply. Now, foodies, head to their facebook page and try your luck to win a fresh Mareeba Gold pineapple prize pack! Disclaimer: Adelaidefoodies.com was sent these pineapples for media review but all opinions are my own. Previous Post HelloFresh is in Adelaide! Love pineapples and their versatility! Great recipe Xin and great giveaway!